« You Know Facebook Connect but why not LinkedIn Connect? 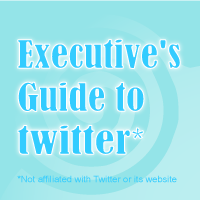 I’m pleased to announce that the Executive’s Guide to Twitter released two free online courses for executives and other time-starved people who want to understand and use Twitter effectively. Twitter 101 shows why Twitter may be important to your career and company while Twitter 201 is the how of Twitter. Each course is divided into several classes which take about 30 minutes each, so you can squeeze them into small weekend, airplane or lunch slots. As I wrote in December, Twitter is transforming communication and interaction because it’s a fundamentally new medium, yet precious few executives understand how it is changing the world around them. The telephone in 1910 can illustrate the point: people who didn’t use it couldn’t fathom how it was changing customer and stakeholder expectations, not to mention sales and service. Such transformations begin slowly, then explode. Even today, between five and ten percent of people with Twitter accounts are responsible for almost all the tweets sent each day. Executives need to get on Twitter so they can understand the opportunities and threats to their businesses and careers—because communications with stakeholders are changing. The problem is, the value proposition isn’t clear, and executives perceive that learning Twitter takes too much time. The Executive’s Guide to Twitter fills that gap. Its two free courses are subdivided into several classes, each requiring about half an hour to complete. This gives executives a plan, and classes in small chunks form the process. Twitter 101 is the why of Twitter. Why is it important? Why might it apply to your business or career? Twitter 201 is the how of Twitter. The Quick Launch Guide gets you online with purpose in about 30 minutes. Value vectors enable you to increase your purpose and efficiency tremendously. For more details, see Free Courses in the main navbar, top. The online course is culled from much more in-depth work I do with enterprise clients whose teams I mentor.